PSICAN - Paranormal Studies and Inquiry Canada - Can you predict the future in remote blind Zener card draw? Can you predict the future in remote blind Zener card draw? An Oklahoma City parapsychologist, Ron Cross, is leading a remote international clairvoyancy test online in the coming month. 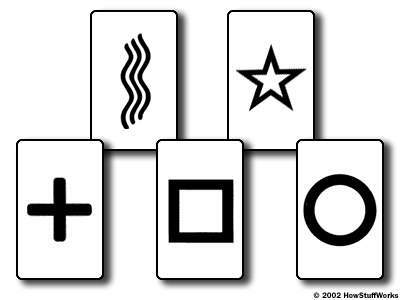 It is to test people’s abilities to predict future events via a staple of extra-sensory perception testing, Zener cards. Although the test officially commenced on Monday, participants are still welcomed and the project runs until June 26. Each night at 3 a.m. GMT (11 p.m. Eastern / 8 p.m. Pacific time), Mr. Cross will draw a Zener card. Each Zener card has a symbol on it: square, star, waves, plus sign or circle. It is very simple: you guess what symbol will been drawn on each of the 30 days, starting on May 28, complete the list and e-mail it to Mr. Cross before the end of the experiment on June 26. Here's the twist! “I will not look at the cards until the end of the experiment to see what card was drawn on a particular day,” Mr. Cross wrote on International Paranormal Investigators message board. “The reason for not looking is to reduce the chances of telepathy giving away the identity of the card on a daily basis.” Thus, this will test people's ability to clairvoyantly predict the future drawing of the cards. Mr. Cross recommends participants predict what the cards will be for the coming seven days, write that down, put the list away and don’t look at it until they are ready to submit all of their lists. By the end, they will have completed four lists in total (the last of which will have two additional days added onto it). Then they should submit their results prior to June 26. If you have any questions or if you wish to submit your list before the end of Mr. Cross’s experiment, you can reach him at prosghosthunters@yahoo.com.